But, back to buisness. My intention was to make a card that could be used for guys as well as girls, and I'm fairly pleased with it in that respect! Other than the Prima flower, the only embellishements are some buttons, square eyelets and some white Scrapper's Floss. The papers are MME 29th Street Market and DCWV Doodlin' around the year stack. Some Core'dinations Vintage cardstock was embossed and sanded. The finishing touches were rub-ons from Art Warehouse and Norsk Stempelblad. 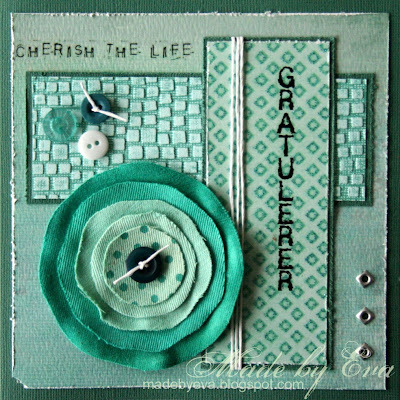 This is so beautiful Eva, I absolutely love the tones of green you have used and your flower is fab!